Guangzhou is one of China's largest cities, with an appealing mix of retail frenzy and capitalist energy tempered by ancient traditions and well-preserved historical districts. Capital of the Guangdong Province in southern China, adjacent to Hong Kong and Macau, Guangzhou was formerly known in the West as Canton (the home of Cantonese cuisine) and has a rich heritage in tea production as well as delicious food. Today, the city skyline is dominated by massive skyscrapers, which play host to vast business and trade enterprises. This ancient trading hub was once a major terminus on the maritime Silk Road and it is a great destination for history lovers as well as businesspeople. Along with many cultural and historical attractions, Guangzhou has numerous shopping malls; some of Guangzhou's best shopping areas include Shangxia Jiu Lu, Beijing Lu, and Renmin Nan Lu. Cantonese cuisine and opera are highlights of the Guangzhou social scene, and the city's history (dating back to 214 BC) can be discovered at sites such as the Temple of the Six Banyan Trees, the Guandong Folk Arts Museum, and the Museum of the Western Han Dynasty. 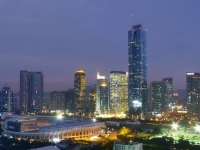 Travellers to Guangzhou will probably find the summer season a bit hot and rainy, but the winters, from December to March, are mild and sunny and a wonderful time to explore this fascinating city. There are a number of buses and taxis to transport tourists in the city, and there are frequent flights and trains from Guangzhou to other major Chinese destinations, such as Beijing and Shanghai. The city receives more than 100 million visitors each year and it is well-equipped to accommodate them.